Location: Along the Milwaukee River from Riverside Park to Caesar Park within the City of Milwaukee, in Milwaukee along the Milwaukee River from Riverside Park to Calnar Park. The East Bank Trail was completed prior to June 30th, 2006. This was the result of several years of planning, numerous partnerships, and several different organizations participating in actual trail building and landscape restoration. The trail runs along the east bank of the Milwaukee River and connects two Milwaukee County Parks, Riverside Park and Caesar Park. Easements were obtained from a couple of landowners located between the County properties. Trailhead sculptures were created by a local artist at each end of the trail. 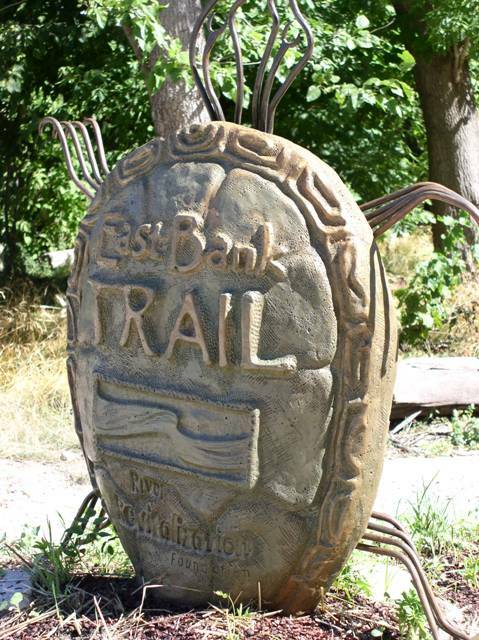 These sculptures are in the shape of a turtle and each partner involved with making this trail a reality are listed on a tile on the turtle itself. This project would not have been possible without a grant from the Wisconsin Coastal Management program and financial and physical assistance through the River Revitalization Foundation (RRF). Actual work crews consisted of Milwaukee County Trails Crew, Marek Landscaping, LLC, AmeriCorps*NCCC, Milwaukee Community Service Crews, RRF staff and volunteers, as well as many others. 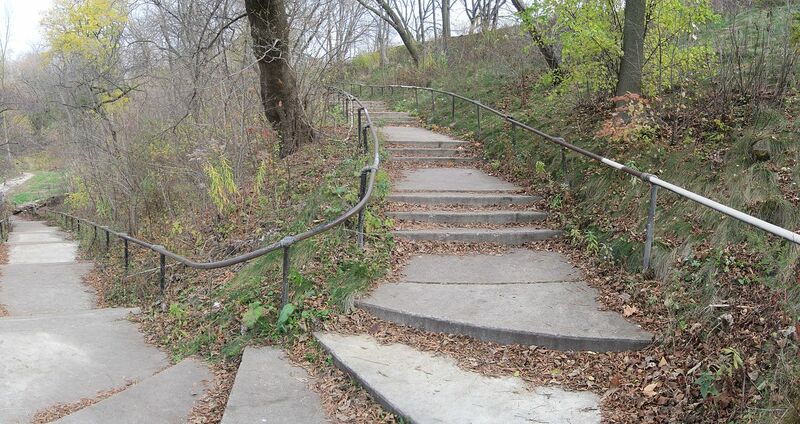 The trail provides access to the Milwaukee River in a way that was not possible before. When the Beer Line extension of the Oak Leaf Trail is completed on the west side of the river, a loop will have been created. There are ample opportunities to view birds and other wildlife. Native seed and plants were part of the landscape restoration and will enhance this environmental corridor. A canoe and kayak launch is located just off the trail near the Urban Ecology Center (UEC). The Urban Ecology Center, another partner with the parks, regularly lead youths and adults along portions of the trail as part of their outdoor education activities. A grand opening ceremony in the summer of 2006 was very well attended by the various partners and trail enthusiasts. Milwaukee County Dept. of Parks, Recreation, and Culture have applied for another Coastal Management grant to expand this great trail. Southern end of the East Bank Trail at Caesar's Park. Photo by Buster8079.